Perhaps his pawn on h1 may have provided a clue that he was not conversant with all the subtleties of the game as yet. 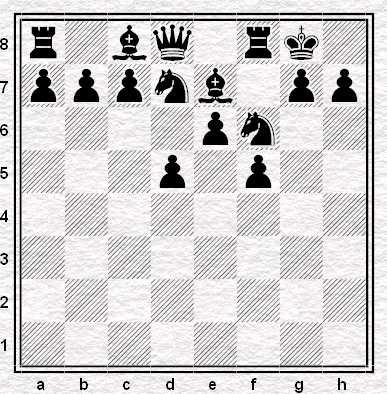 I'm not sure what you mean about the pawn but your comment did inspire me to take another look at the post and I noticed there was a mistake in the second diagram (B should have been on f3 not e2) - now corrected. It seems that before I noticed your comment a fellow blogger corrected the diagram. I, in turn, corrected the correction. Thanks for pointing out the original mistake. Black is much better here. He can play either c5, or c6 followed by e5. Also stick a N on e4. Whites pieces are on silly squares. Yes I agree - although White's play is closer to being sensible than might appear at first sight.